Revithia giahni sti gastra is a vegan dish with stewed chickpeas, traditionally cooked in a clay pot and baked in a wood burning oven. However, not all of us have wood burning ovens or clay pots but we can still cook it in a Dutch oven or in any casserole dish, in our home oven. If you don’t have any of the above, use a baking tin which cover with an aluminium tent. Before going to the recipe, I would like to give you a virtual tour to Sparti. You can find more virtual tours here. Sparta or Sparti (Σπάρτη) as it is called in modern Greek, is the administrative capital of the prefecture of Laconia. It is 250 kilometres from Athens, located in the Southern part of Greece and has a population of 35,259 after its merging with six nearby municipalities in 2011. It is situated in the fertile Laconian plain, on the right bank of the river Evrotas. The site was strategically located during the antiquity, between Mount Taygetus, on the West and Mount Parnonas on the East. The majority of the population continue to live in the town itself while today Laconia is an agricultural site where it is famous for its olives and of course its olive oil, citrus processing, honey,as well as a variety of other fruits and vegetables usually distributed throughout many other towns and spots in Peloponnese. In ancient times, Sparta was one of the most important kingdoms, not only in Greece but also to the rest of the ancient world. Sparta would occupy the entire regions, which nowadays are known as Messinia and Laconia. Only a small portion of that ancient territory continues being called Sparta, an area located towards the northern side of Laconia. Its seaport was situated at Gytheion, another ancient city, situated 43 km from the centre of Sparti towards the north-western area of the Gulf of Laconia. After the independence, King Otto decided to build the new town of Sparti very near the ancient one.In fact now that the city is expanding, a lot of ancient ruins are being discovered in the modern city. The city was designed with the intention of creating one of the most beautiful cities in Greece through the use of tree lined avenues, squares and parks. It is surrounded by ancient sites, such as the sanctuary of Artemis, the Menelaion and the sanctuary of Apollo of Amyclai (8 km south of Sparta). Sparta is a lovely destination, which offers to the visitor the chance to learn about its history and glorious past and explore many constructions, ruins and structures in the area. The centre of the city is crowned with many neoclassical buildings and monuments. Modern Sparti is a very interesting, small town and most of the places to visit are within a walking distance from the central square (location 5). On the square is the neoclassical building of the Municipality, which is surrounded with lots of restaurants and cafeterias. Opposite the square is the commercial centre where you will find most of the shops and every Saturday morning there is a farmers’ market there (location 9). The square is situated on Lycourgos Avenue. This is the road to take, if you wish to head towards Mystras. Further up Lycourgou avenue you will pass from another Square where you will find Evangelistria, the cathedral of Sparta and the statue of Lycourgos, father of Sparta (around 800 b.C.) King and lawgiver (location 2). Next to the square is the modern building of the Courthouse and across is the public library, which is one of the most important buildings of the city, which represents the rich cultural life of Sparta as well as another neoclassical building, now a Club for the Greek officers (location 2). Behind the square is the University of Sparta (location 8). The new town, as in most towns, is now built with multi-storey buildings whenever the old houses are torn down. However, if you walk in the side streets you can still see some old houses, which hopefully will be restored. The other main avenue is Constatinou Paleologou. This is the road where a lot of the hotels are situated and is the road to take if you wish to visit Amyklai, Gytheion or other lovely locations such as Elafonissos, Monemvassia, the Caves of Diros, Areopolis etc. (location 7). Agios Nikonas is the patron saint of the city and the church is situated a block behind Paleologou Avenue (location 3). On the right side of the church is the Archaeological Museum, which is housed in a neoclassical building, with a lot of important exhibits (location 4). The Koumantareios Art Gallery is housed in another neoclassical building where you will find a permanent collection of oil paintings by western European artists but periodically some other exhibitions take place there. The unique most interesting Museum of Olive is also situated in the centre of Sparta and is open to the public all year round (location 10). During September, the Spartathlon, the ultra distance race, about 250 km, takes place every year. Long distance runners from all over the world run from Athens to Sparta, following the footsteps of Pheidippides, the messenger, who was sent by General Miltiades to seek Sparta’s help against the Persians 490 b.C. The race terminates at the Stadium of Sparta (location 1). During the second invasion of the Persians, 480 b.C., King Leonidas, who was also a general, led a small army of 300 men to fight the larger army of Xerxes, King of Persia, in Thermopylae. According to Herodotus, King Leonidas had been warned by the Delphic oracle that either Sparta would be destroyed or their king would lose his life. Although Leonidas could leave and he and his army be saved, he chose the second alternative telling Xerxes “Molon lave” meaning “Come and get us“. This distraction gave enough time for the rest of the Greek army to retreat into southern Greece. King Leonidas’ statue is outside the city stadium (location 1). Their most famous dish was melas zomos, meaning black broth, which was so much valued that the elderly men fed only upon that, leaving what flesh there was to the younger. The Spartan melas zomos, or black soup, was a staple soup made of boiled pigs’ blood and vinegar. The vinegar was added as an emulsifier to prevent the blood from clotting. Did you know that blood soups are still eaten in some countries? !! 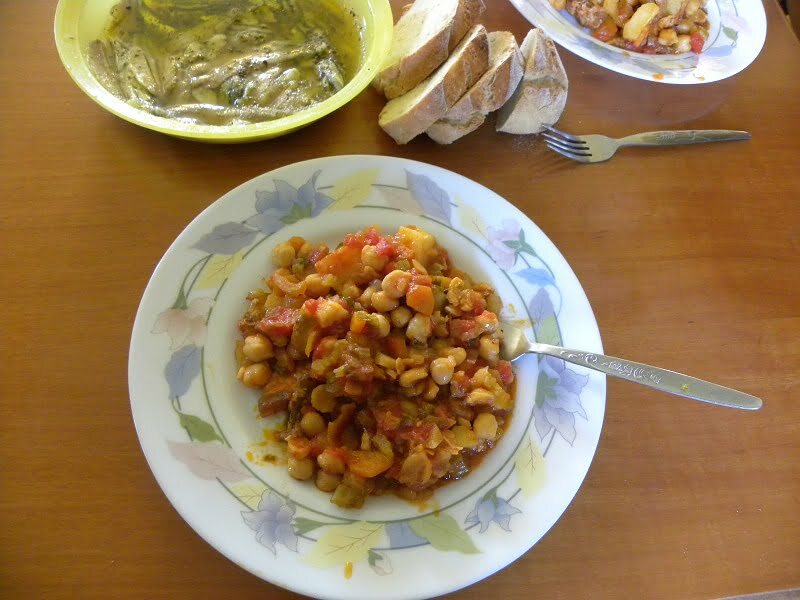 My recipe does not have pig’s blood or vinegar but it is a healthy recipe of stewed chickpeas (giahni). Giahni is the method of cooking which is a stew with tomatoes and olive oil. The dish is traditionally cooked in a clay pot (gastra) with a lid for out-doored wood ovens. However, if you don’t have one, you can cook it in a casserole dish, in the oven. If you don’t wont to cook it in the oven you can use a pot and simmer it on the stove top. In this case you will need to add more water and to be checking it more often until it is cooked. Some times, especially during the fasting periods, I like to add some rice to this dish, just like we cook lentils in Cyprus (Fakes Moudjentra). This step is optional but combining legumes with rice makes this dish of higher nutritional value, as the rice complements the protein in this dish. It is very significant to get nutricious food during long fasting periods and especially for vegans. Just before the chickpeas are ready, I add some rice and cook it in the sauce for 10 – 15 minutes or until the rice becomes soft and absorbs all the fluid. Soak chickpeas (I use peeled chickpeas) from the previous evening. Put the chickpeas in a pot and add water to cover them. Bring to a boil and remove froth forming on top. Rinse and remove any peels that have not been removed. Return to the pot with fresh water and simmer until they are almost soft. Strain and place in a casserole dish or a baking tin. Heat the olive oil and sauté the onions and garlic until translucent. Add the carrots, the peppers, tomato, honey and spices. Bring to a boil and add the parsley and mix. Pour the sauce on the chickpeas and cover with the lid. Bake in a preheated oven to 180o C for about 1 hour and 30 minutes. Add the rice (and water if necessary) and cook until the rice is soft, for about 10 – 15 minutes. Revithia giahni sti gastra is a vegan dish with stewed chickpeas, traditionally cooked in a clay pot and baked in a wood burning oven. However, not all of us have wood burning ovens or clay pots but we can still cook it in a Dutch oven or any casserole dish in our home oven. If you don't have any of the above, use a baking tin which cover with an aluminium tent. Add the rice (and water if necessary) and cook until the rice is soft, for about 10 - 15 minutes. This and many more Greek recipes are included in my cookbook Mint, Cinnamon & Blossom Water, Flavours of Cyprus, Kopiaste! You can find more Lenten Recipes here. My daughter has been doinf latin for six years now and she would love to visit this place, love that chickpea dish too. Really comforting bowl of dish. Thanks for taking us on the trip to Sparta with you, Ivy! That chickpea dish look absolutely delicious (no pig’s blood for me either, please!). Ivy, thanks a lot for sharing all these beautiful pictures with us. Chickpea dish looks absolutely delicious. Thanks for the tour of Sparta! I love chickpeas – this looks so delicious, very flavorful. Thanks for all the tours Ivy:-) If i ever get to go to Greece (my dream) I will recollect all the pictures that you are posting:-) All the buildings remind me of India.. they are constructed in the same style.. probably influenced by all the invasions we have had (from Greece too!!) the names remind me of a lot of history we had to study during our school years. I was in Sparti in spring time. I can recommend to visit the village of Anavriti. It is right ourside of Sparti. Stunning vievs over the valley and great hikes around there. Aaaah! You bring back so many memories Ivy! A great write up for a small city. And the revithia giahni are delicious! I often do a similar version in the oven with a few Indian inspired spices with spinach. you are amazing,of course…the post it’s a little “chef d’oeuvre”!i use this recipe ,too,for prepare chickpeas .it’s very tasty,i think. That chickpea dish is gorgeous! Yummy! What a beautifully historic place and lovely pictures. The recipe is great, simple yet full of flavour. Thanks so much for posting these lovely pictures and for all the information given in the post. I would like to visit Greece in the future and your posts will certainly help anyone wishing to visit. Keep it on and hope you’ll post more destinations. Love that chickpea stew, full of Mediterranean flavours. This is a lovely chickpea dish, I love the grated carrots in it as I use grated carrots a lot in cooking so I just know that this recipe is going to taste fabulous! I love that you used honey and all spice, I bet the aroma is wonderful. I love the shades of yellow used on several of the buildings. Must be a beautiful city. Your chickpea stew looks fantastic! Thanks for the lovely photos of and information about Sparti/Sparta. I enjoyed them very much. Your chickpewa stew looks delicious – perhaps the chickpeas in my cupboard should be used for this. Thanks for the wonderful tour of Sparta! chickpea stew sounds so delicious! Sparti is much like many other Greek cities where old buildings are giving away to modern apartment blocks (pity). Sparti was a base for my travels to neighboring towns and that is what impressed me so much (the horia), the people and of course, the food! I’m very much interested in the healthy Greek kitchen. Hi Yvan. I don't know how hummus is made in Kassos but I have the Cypriot recipe for hoummus posted. Oh and by the way, the pasta with yogurt is a Lebanese recipe very common in households and very much liked; I think it is also made this way in Syria,. Joumana, I think you are referring to the film This is Sparta. Next time for pig's blood soup! Thanks to Ivy travel 🙂 If I ever happen to go to Greece (my dream) I remember all the images are posting 🙂 All buildings reminded me of India .. are built in the same style .. probably affected by the raids that we had (from Greece too !!) the names reminded me a lot of history we had to study during our school years.